Taste of Japan is a great looking HTML template for Japanese restaurants. The template was developed by ProspektDesign and it is featured at ThemeForest. Taste of Japan is a template that features a classy and elegant layout. Actually, each page has its unique layout created specifically to present your content in a nicely organized and attractive way. It allows you to publish a great amount of content and feature many important posts on your homepage. The template doesn’t only look good; it also features many great options that will enhance the experience of your visitors when they enter your website. The colors chosen for this template will give your website an actual taste of Japan. With white, black and rich red, your website will look attractive and it will fit the niche of your restaurant perfectly. A nice quality photo of a Japanese delicacy at the very top of your website will instantly make your visitors hungry for your mouthwatering, healthy meals. A nice, warm introduction written from the heart and posted as a pleasant welcoming note will make your visitors feel nice and loved. You will also be able to represent your staff, and dedicate a page to the people who make all that delicious food, so your visitors know who the people who make their bellies full are. The “about us” page can be used any way you want to, whether you decide to introduce your guests to the history of your restaurant, the tradition of Japanese food, or the very dishes you prepare for them. The blog area is a perfect place for posting just about anything you want. This Japanese restaurant HTML template offers a nice, clean menu with prices and leaves your visitors a commenting option, so they know their voice will be heard and appreciated at your place. One of the most important features is surely the nice reservation form which will allow anyone to easily book a table at your restaurant right there on your website. A simple, working contact form was also added to complete the awesome package this template makes. 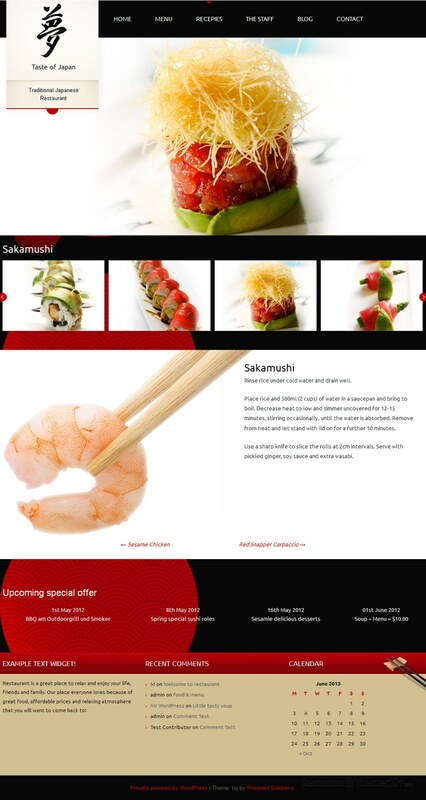 Besides this HTML template you can buy Taste of Japan also as a WordPress restaurant theme.